Submitted by Jeff Buster on Tue, 04/30/2013 - 11:13. If you look at the image, you can just barely see the roof lift cables extending between the "arm" and the white roof of the stadium. But, the roof doesn't lift. 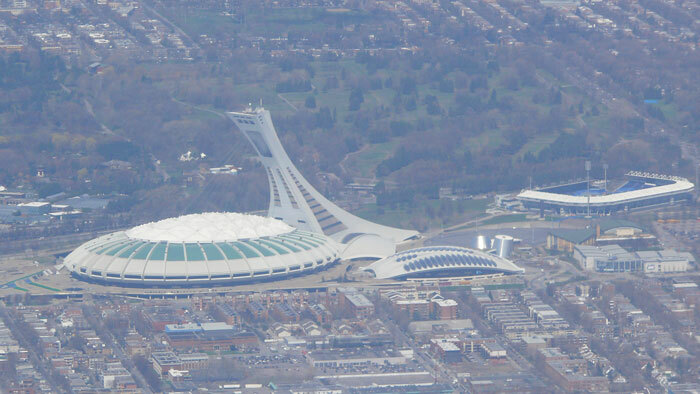 As it turns out, this 1976 Montreal Olympic stadium - though still standing and still used - is forensicly studied as an example of engineering failure and cost over runs. Here is a link to details about the Montreal Olympic Stadium on MATdl.org - a multi school supported site for the forensic study of engineering failures. Cleveland State University's Norbert Delatte, P.E., Ph.D., Professor and Chair, Civil & Environmental Engineering Department is the lead investigator. Click through MATdl.org to view some of the failures - of dams, buildings, bridges, etc. Good educational tool.